The FMCG Sustainable Design Factors Framework is a conceptual framework that explains the iterative relationship of eleven factors that influence the successful implementation of sustainable design at the front-end of new product development process within the fast-moving-consumer-goods (FMCG) sector. The framework encompasses three dimensions of sustainable design implementation from organisational to operational factors as well as barriers that should be maintained from the front-end throughout the entire New Product Design (NPD) process. The applicability of the framework beyond the FMCG sector is in the test phase. The eleven factors are required from the front-end not only at the early stages of the design process. 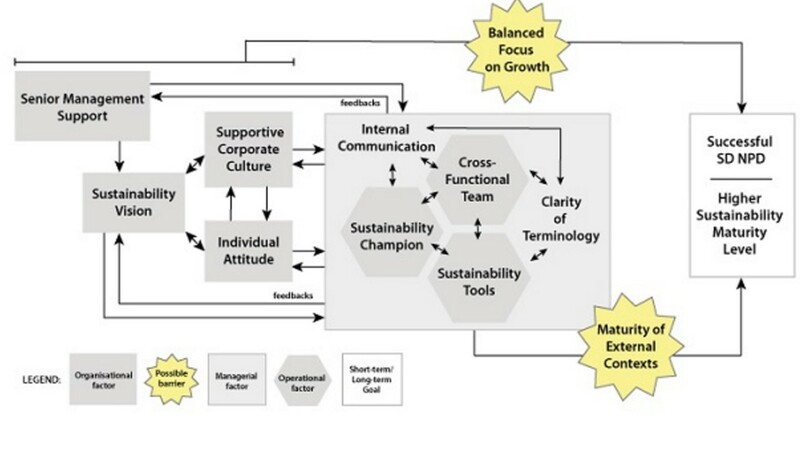 Six organisational factors (and their 18 accompanying elements, see Table 1) such as senior management support, sustainability vision, internal communication, cross-functional team, supportive corporate culture and individual attitude precede the other five factors. These six are followed by three operational factors sustainability champion, sustainability tools and clarity of terminology with their six elements. Finally, two potential barriers: balanced focus on growth and maturity of external contexts are proposed which may fundamentally inhibit the entire practice if they are not in place. The framework guides industrial practitioners with steps to follow to diagnose their sustainable design implementation practice and to develop a more holistic sustainability strategy with a long-term view. In mature companies the factors have a stronger role, and are present more often, in the progress towards sustainability than in less mature companies. It is important to note that a crucial part of successful implementation of sustainable design relies more on the commitment and accumulation of a long-term sustainability vision and strategy within a company, rather than the presence or absence of single factors. For more information contact Dr Curie Park.